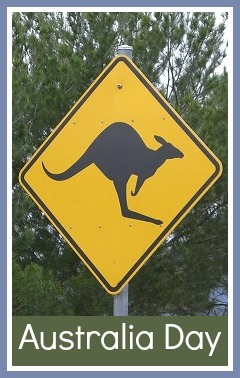 I love Australia. Australia has fascinated me since I studied it years ago at primary school, and a few years ago I was lucky enough to tour the country on a fabulous holiday. Australia Day is celebrated on January 26th, and so I put together some activities for us to do to teach Harry a little bit about the country. As an introduction I first sat him through our holiday photos. They showed him the huge variety in terrain and climate across the country which is part of its appeal to me. We also talked in simple terms about how when it is winter here it is summer in Australia, and vice versa. Australia is a really easy country to find on the map. Inspired by an Australian cookie map that I saw online (sorry, the original link is no longer available) we made our own Australia shaped biscuit. I used my trusty shortbread recipe (175g plain flour, 50g sugar, 125g butter) because I know that it keeps its shape well when cooked. I printed out a good sized outline map and placed it under greaseproof paper. Then I rolled the dough out to cover the outline and cut around it with a sharp knife. When it was cooked we decorated with icing and sprinkes. I didn't bother too much about the details, but when Harry is a bit older and we do it again I'll try and encourage him to copy some of the natural features of the landscape using the decorations, following a map from the atlas like in the link above. I remembered when we studied Australia at school that we painted a wall of the classroom using sticks as paintbrushes. 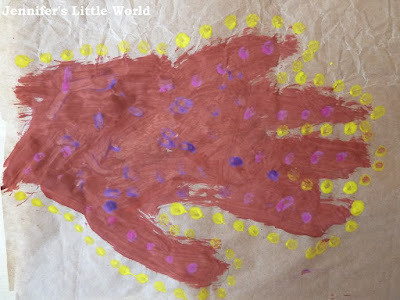 I tried this with Harry but it was a bit too difficult for him, so instead we used cotton buds to make the dots that are a feature of Aborginal art. We looked at some pictures found using Google images, and then Harry chose his favourites as inspiration. When I'm looking for flags to print I always turn to the Activity Village Flag Printables. 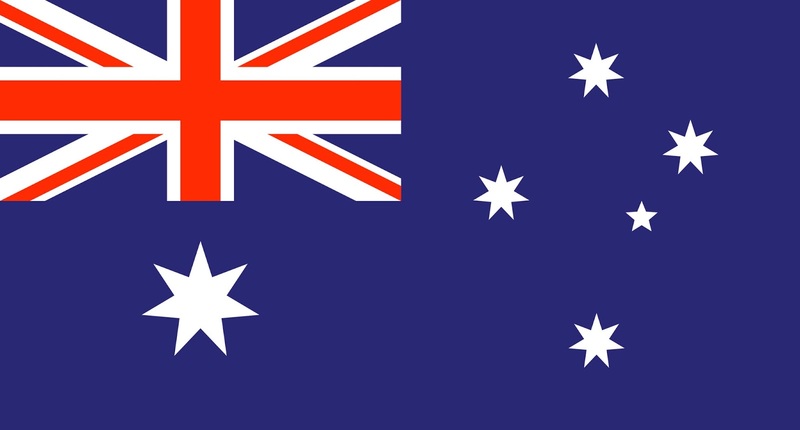 The Australian flag is an easy one to colour. 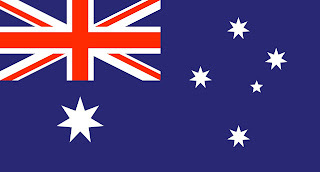 The Union Flag in the top corner symbolises Australia's history as six British colonies, and historically a demonstration of loyalty to the British Empire. The largest star has seven points - a point for each of the six federating British Colonies (New South Wales, Queensland, South Australia, Tasmania, Victoria, Western Australia) and one for the Territory of Papua and any future territories. The remaining five stars form the constellation the Southern Cross, one of the most distinctive constellations seen from the Southern Hemisphere. We talked about all the different animals that you can see in Australia, some that he was familiar with (kangaroo, crocodile, snake, koala) and some not (echidna, goanna, platypus, cassowary). I found some Australian animal colouring pages to do, again on Activity Village. While we did the colouring we listened to some Australian songs - Kookaburra sits in the Old Gum Tree and Waltzing Matilda. There's plenty out there on YouTube, and some of them explain the unfamiliar language as you go along. I really enjoyed doing these projects, and Harry learned a lot too. We'll definitely be doing more next year, and I'm going to start thinking about some ideas for other countries! And some tips on how to hold a themed day at home for children. Lots of great ideas - my youngest sister and her family are about to move to Australia, and I'd like the kids to know more about where their cousins are going to live. I do feel sad about her leaving, still in denial I think - but it'll be such an adventure for them, and we'll take a trip down under at some stage. You must feel sad, that's such a long way away! I hope that you get to visit them soon. Such a great idea, thanks for sharing all these ideas. Australia is a fascinating place (I'm biased)! I have a list of Australia books on my website that i compiled this week, that you may like to take a look at - some fab ones which really highlight the country. I love going to soft play!